For this month’s birthday pick, I’m doing something a little different: 1) I’m focusing on the youngest ages for a change 2) I’ve chosen not one but two books (which make a perfect pairing) and 3) I’m encouraging you to throw caution to the wind and take a chance on books that aren’t brand new but are commonly unknown. In short, the next time you are headed to a birthday party for a one or two year old, you’re in luck. I Took the Moon for a Walk (Ages 1-4) and Listen, Listen (Ages 1-4) are both illustrated by the supremely talented Alison Jay, whose praises I have sung here before. With their over-sized 9” by 9” format, these hefty board books mirror another favorite by Jay, her ABC: A Child’s First Alphabet Book (which tends to be well known and for good reason: it may just be the best alphabet book ever illustrated). Alison Jay’s books are the ultimate gift. Packed with hidden surprises, layered with detail, and shimmering in vivid colors underneath a “crackle” finish, Jay’s paintings beg to be poured over again and again. When he was a toddler, my son JP absolutely adored I Took the Moon for a Walk, which is inspired by the illusion of the moon moving with us as we walk. Alongside Jay’s illustrations, Carolyn Curtis’ lyrics chart a little boy out for a pre-bedtime stroll: “I took the Moon for a walk last night. It followed behind me like a still summer kite.” The child-centric premise (why shouldn’t the moon be following my every move?) has always been immensely alluring to my son, who like many children is fascinated by the moon. Although he hasn’t read the book in a probably a year, just the other day when we were out walking at dusk, JP spotted a nearly full moon and immediately broke into a jog, craning his neck toward the silver disc in the sky and yelling back at me, “Look, Mommy, it’s like we’re taking the moon for a walk!” (at five it seems his world view has now broadened to include his family). My two year old daughter, on the other hand, is currently entranced by Listen, Listen, an onomatopoetic ode to the seasons, written by Phillis Gershator, and which seems especially fitting to be reading at the beginning of a new year (although, in few disclosure, it actually begins with summer’s “chirp, chirp, churr, churr, buzz, buzz, whirr, whirr”). 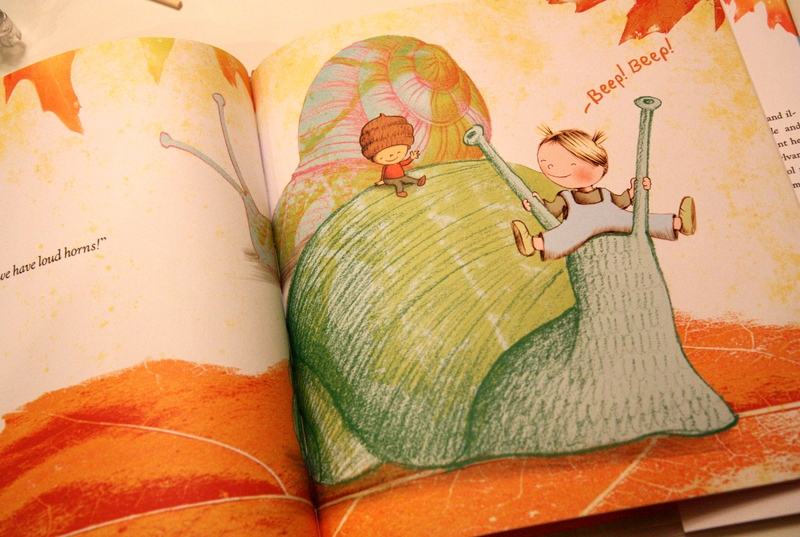 While the book’s text is all about the sounds of the seasons, the illustrations are all about looking; even after dozens of readings, Emily and I continue to find something new on every page. Alison Jay is like a magician who seems to conjure up new details in her paintings from some nearby invisible location (how could I have missed the little black witch trick-or-treating in the distance? Ha, I never noticed that the ladybug has her legs over her ears because the tulips are shouting so loudly!). Naturally, being obsessed with all things baby, Emily’s favorite pages are those devoted to springtime, in particular to the baby chicks hatching from eggs and falling on their bottoms beside their mother. Even JP has joined us for a few of our more recent readings (naturally, being obsessed with all things competitive, he likes to challenge Emily to see who can find the icicle or the dragonfly faster in the bonus seek-and-find pages at the end). But I digress. The important thing is that with these two treasures, you will be armed with gifts that keep on giving with every season, with every night. You are currently browsing the New Baby & Shower Gifts category at What to Read to Your Kids.